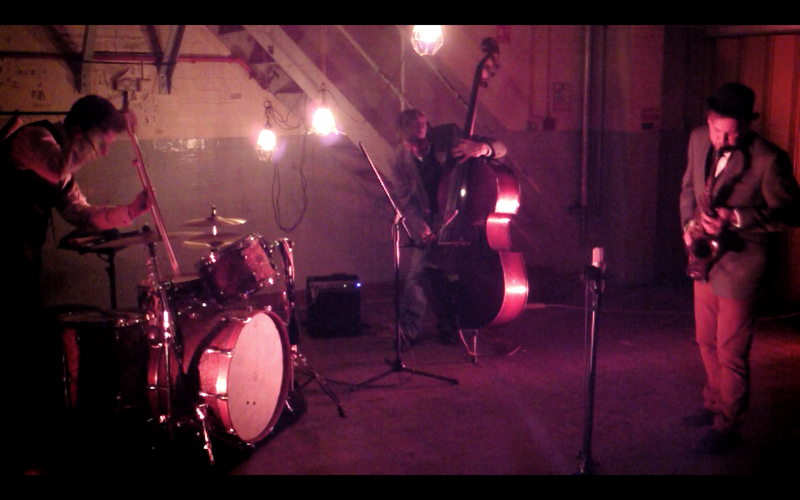 I am a drum set player from Leicestershire, England, specialising in free improvisation. The visceral nature of performance has always been important to me as a musician working in various genres, but it’s the expressive opportunities afforded by freer forms which provide a level of connection with my instrument, music and other musicians I can find nowhere else. I collaborate with artists from a variety of disciplines including jazz, world, classical, rock, free music and electronica, and am equally happy performing solo as with small and large format ensembles. Current projects include: ‘Etudes: Artisan and Industrial in Metal and Wood’ and ‘Fire Point’ (solo drum set recordings); solo drum set performances; duos with John Russell (guitar/drums), Alan Wilkinson (saxophones and bass clarinet), Myoptik vs Allatson (electronica/drums), Tim Harries (bass/electronic/drums/recording); trios with Bruce Coates (saxes) and Chris Mapp (bass/elec’s); Rick Jensen (sax) and Dave Tucker (bass/guitar) South Leicestershire Improvisors Ensemble with Virginia Anderson, Bruce Coates, Christopher Hobbs, Rick Nance, Trevor Lines and Peter Wyeth. Lee is a regular collaborator with several contact improvisation groups and is a co-director of the Near Miss Company. Events: SLIE concert series, (Leicester – ongoing), regular contributor to Mopomoso concert series, The Vortex, London and Centrifuge (Midlands/North). Kandala Records showcase, Cafe Oto (2016); I’Klecktik Ballistick allayer, I’Klecktik (2016); Discovery Festival, Walthamstow (2017). Messrs. Allatson, Brackley & Coates, recording at Quad Studios, Leicester UK, 2015. My beginnings: When I think of my early days playing with free music styles, I don’t think I was ever really aware of influence as such, more a simple and keen interest in experimenting with sound and developing performance or compositions from that. Far more poignant realisation of my coaxings came much later, having already been regularly active within free music environments along with my trusty 1970’s Gretsch drum set, which by now had been modified and augmented to serve all manner of sonic realisations born from how I wanted my expressions on the instrument to be heard. I remember watching the 1968 Franklin J. Schaffer directed Planet of the Apes, with its incredible – and terrifying – avant-garde soundtrack by Jerry Goldsmith: fascinating and unpredictable percussion effects; wide open sounds – and so much space, I kept thinking: “…this sounds like my drum set! …and it even sounds a bit like me playing it! ?” A penny dropped with echoplex-drenched profundity, as I then glanced over to my collection of VHS tapes: The Good, the Bad and the Ugly; Two Mules for Sister Sarah, Papillon, Magnum Force… My fascination with avant-garde music and percussion was born from a love of 1960’s and 70’s film soundtracks. The Beast of Bengal: The kit I use for improvising is based around a 1970’s Gretsch – and is actually a mix of 2 kits: I bought the original 14″, 18″ and 24″ drums in walnut finish, which had been adapted with a whole bunch of unoriginal fittings and holes left from other previous meddlings, so was never going to make it back to original. I was later given 2 more black drums from the same range (13″ and 16″) which had been rescued from a chicken coup – and so came complete with feathers and poop! 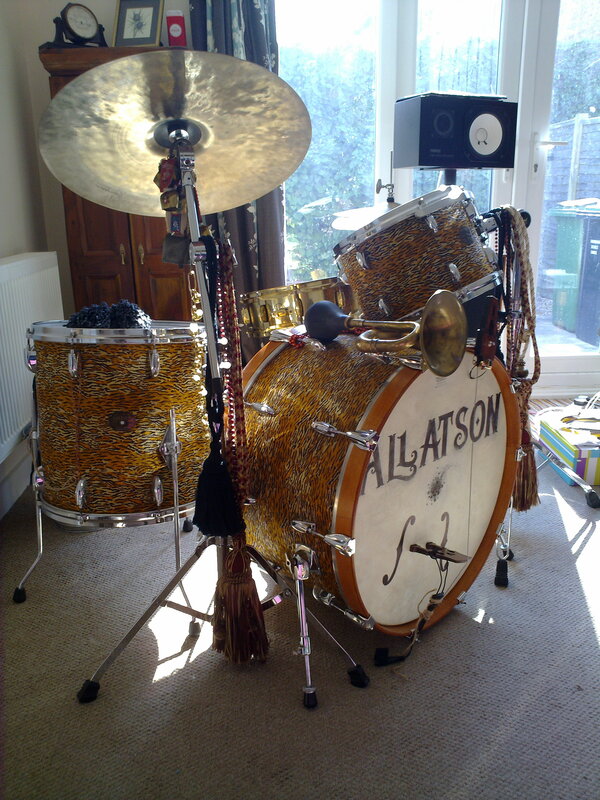 I undertook this as a fun renovation project, re-covering all of the drums in thin tiger skin velour, sensing this to be suitably 1970’s – so what Huggy Bear would have wanted – and yes, the great Lalo Schifrin also figured highly in my early life’s soundtrack. I wanted this kit to really sing: ringy and toneful. The drums come from the larger end of their scale and I felt I wanted the notes to sustain – quite opposite to the percussive norm. I like the idea of being able to access flexibility in note lengths and now actively manipulate these when improvising. The toms are fitted with RIMS/Gauger isolation mounts and single-ply coated drumheads to aid this. The bass drum is un-drilled, undamped and un-ported, save for a square grille of small holes for mic’ing and air escape purposes. This drum is also fitted with a single-ply, vintage calfskin-style drumhead configuration. The Beast of Bengal: my 1970’s Gretsch drum set.